Le membre Orféo nous a signalé que le dernier chapitre de Dark Mirror est enfin arrivé. 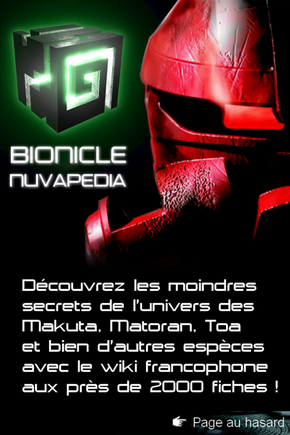 Il conclut le voyage de Takanuva à travers les dimensions. Toa Tuyet stood over the battered, semi-conscious body of Takanuva, Toa of Light. He did not stir. Being blown through half-a-dozen walls by a focused tidal wave would do that to you. Tuyet smiled. The ruler of the Toa Empire slipped off her Mask of Intangibility, and replaced it with a Kanohi Olmak: the mask Takanuva had come seeking. This mask alone had the power to open gateways to inter-dimensional space, and it was Takanuva's only hope of escaping this twisted world. "Your friends outside are dead, or soon will be. I admit I was surprised to find they still had some fight left in them after 3500 years. But, they can't be allowed to rob the Matoran of the peace I have brought them." "Peace?" he said in disbelief, "Is that what you call perverting the Toa into secret police, terrorizing the villagers, killing anyone who opposes your rule?" "That's true, my world is messier than yours, more dangerous in some ways, but it is a world that's better, because you're not in it, Tuyet." The Toa of Water unleashed her power, bringing the ceiling down, but Takanuva was not there. Instead, he sprang from the opening at the far end of the hall, hurling blinding light at Tuyet as he made a grab for her mask. She spun, caught him by the arm and threw him hard to the floor. Takanuva attacked again, hurling bolts of Shadow and Light. To his amazement, Tuyet parried them with ease. Seeing his surprise, she laughed. "You know, we had no Toa of Light in this Universe. We didn't need one. And in a few moments, we will be back to being without one." Tuyet was about to strike when a strange sound penetrated the Coliseum. Takanuva raised his head and glanced at a hole in the wall. He saw hundreds - no, thousands - of Matoran marching toward the building, all of them armed. In the distance he could see Airships and sea-going vessels carrying other Matoran, Dark Hunters, Vortixx and others. All of them were descending on the city, their eyes fixed on the Coliseum. "Still think the rebellion is over?" Takanuva asked, "Or maybe it's just beginning." Takanuva looked right into Tuyet's eyes. "Then who would there be left to protect? Who would you have made your perfect Universe for?" "Very clever, Toa. True, a Universe with only drowned Matoran would not be of much to anyone. But they must be taught respect." Tuyet glanced down at the street. The mob was coming closer, and though she could easily kill them all, to leave her as the ruler of an empire of corpses. Perhaps Takanuva was right. At the least, she could leave and return with an army of Toa from another dimension, enough to stamp out every last visage of rebellion in her own world. She turned away and activated her mask. A portal into inter-dimension space opened before her and she prepared to step in. That was when Takanuva made his move. He somehow managed to hurl himself at Tuyet, snatching the mask from her face. For the second it lost contact with her, its power shut off and the portal began to close. Takanuva, mask in hand, dove through, but Tuyet was not about to let him escape so easily. Even as he cleared the portal, she grabbed on to his leg, trying to follow him. She blasted him with hard bolts of Water, catching his hand and tearing the mask from his grasp. It floated away into the space between dimensions. Takanuva turned back. What he saw horrified him. But his shout of warning came too late. Tuyet was halfway through the portal, trying to drag Takanuva back in. She was so consumed by rage that she never noticed the portal closing until it was much too late. She screamed as reality slammed shut on her body, leaving her upper half in the void and the lower half in the Coliseum on her world. Mercifully, death came instantly. Takanuva hovered in space for a long moment. He wondered what would happen in Tuyet's Universe with her gone. Would the Toa become protectors again? Would the Matoran take control? Or would some group of the Dark Hunters and Makuta become new dictators? Perhaps someday, if he was able, he would return to find out the answer. He turned his head away from the remains of Tuyet, wondering how a Toa could go so wrong, and realizing with a shudder what a fine line it could be between justice and tyranny. Tuyet's life had been wasted, but the lives of no more Toa would be lost if he could prevent it. With grim resolve, he resumed his journey to Karda Nui. Alors que Tuyet et Takanuva sont face-à-face, ils engagent une bataille, bien que Takanuva soit affaibli par le précédent combat. Après une discussion, alors qu'elle a le devant, Tuyet place le Kanohi Olmak sur sa figure, alors que Takanuva en a besoin pour retourner à Karda Nui. Soudain, une foule de milliers de Chasseurs de l'Ombre, Vortixx et Matoran arrive de tous les côtés. Tuyet sait que cela ne lui servira à rien de tous les tuer si cela revient à tuer le contenu de son empire, et que si elle veut les asservir à nouveau, il lui faudrait revenir avec des toa d'autres dimensions. Alors qu'elle tente de s'échapper dans une autre dimension, Takanuva lui reprend son Kanohi pour accéder à sa propre dimension ; mais elle se tient à la jambe de Takanuva, car elle veut lui reprendre le masque. Elle se tient au corps de Takanuva quand la porte dimensionnelle se ferme, coupant en deux son corps. Takanuva peut ainsi aller directement à Karda Nui. TAKANUVA IS BACK !!! Enfin un nouvel allié dans Karda Nui (les Nuva vont en avoir besoin). attends tuyet s'est fait coupé en deux?! Oui car les portes dimensionnelles se sont refermées sur elle! Ouais!Takanuva vaincra!Au fait,où est passé Nidhiki? Enfin bon, elle cherchait à avoir de nouveaux Toa pour asservir à nouveau la population, sinon elle aurait dû affronter tout son peuple en colère, et tous les tuer n'aurais avancé à rien, si elle avait un Empire sans aucune population. On va donc enfin apprendre quel était le message qu'il devait délivrer aux toa Nuvas non? Bah dans le 14ème comic très certainement. et surtout un new topic , alors je vais demander en direct si exo voudra bien une teuf des1 000 sujet/topic ! faite gaffe ! la demande est en direct ! je capiche kedal c'est tout en english!